Federal Communications Commission v. Pacifica Foundation, 438 U.S. 726 (1978), is a landmark United States Supreme Court decision that defined the power of the Federal Communications Commission (FCC) over indecent material as applied to broadcasting. 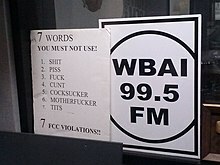 In reference to this case, a poster in a WBAI broadcast booth warns radio broadcasters against using the seven dirty words. Ensuring that unwanted speech does not intrude on the privacy of one's home. The Pacifica Court upheld the FCC’s power to regulate broadcast media, citing two pervading governmental interests. First, the “uniquely pervasive” nature of these broadcasts allows them to seep into “the privacy of the home” without the consent of the viewer. Second, broadcasts are “uniquely accessible to children” whose “vocabulary [could be enlarged] in an instant” by hearing indecent or profane language. The Court held that these two concerns were sufficient to “justify special treatment of indecent broadcasting,” thereby allowing the FCC to fine broadcasters for airing inappropriate content. At first, despite the resounding win in Pacifica, the FCC used its new regulatory powers sparingly. In the 1990s, however, the FCC ramped up sanctions for indecent broadcasts. And by the early 2000s, the FCC began to levy more sanctions with higher dollar amounts—with fines of up to $500,000 for some offenses. In 1997, Pacifica Radio "Living Room" host Larry Bensky prefaced an interview with Carlin by saying: "George Carlin, you're a very unusual guest for Pacifica Radio. You're probably the only person in the United States that we don't have to give The Carlin Warning to about which words you can't say on this program, because it's named after you." In 1996, Congress passed the Communications Decency Act, which criminalized the knowing transmission of "obscene or indecent" messages to underage people. In Reno v. American Civil Liberties Union (1997), the American Civil Liberties Union claimed that the act violated First Amendment's guarantee of freedom of speech. To attain standing, the ACLU published the Supreme Court's opinion on F.C.C. v. Pacifica Foundation on its website, which included a transcript of Carlin's monologue. At least one scholar has argued that modern self-censoring technology—e.g., the V-chip—has significantly undermined the Supreme Court's rationale in Pacifica. ^ FCC v. Pacifica Foundation, 438 U.S. 726 (1978). ^ "Boca Man Forever Linked To George Carlin". WPEC. June 23, 2008. Archived from the original on 2008-06-28. Retrieved 2014-02-18. ^ Samaha, Adam. "The Story of FCC v. Pacifica Foundation (and Its Second Life)" (PDF). Archived from the original (PDF) on 2011-04-19. Retrieved 2011-10-05. ^ Alexander J. Lindvall, Frankly, My Dear, I Don't Give a *Darn*—An Argument Against Censoring Broadcast Media, 7 Ariz. St. Sports & Ent. L.J. 153, 170 (2017). ^ Alexander J. Lindvall, Frankly, My Dear, I Don't Give a *Darn*—An Argument Against Censoring Broadcast Media, 7 Ariz. St. Sports & Ent. L.J. 153, 171 (2017). ^ Alexander J. Lindvall, Frankly, My Dear, I Don't Give a *Darn*—An Argument Against Censoring Broadcast Media, 7 Ariz. St. Sports & Ent. L.J. 153 (2017) (available here). Tremblay, R. Wilfred (2003). "FCC v. Pacifica Foundation". In Parker, Richard A. (ed.). Free Speech on Trial: Communication Perspectives on Landmark Supreme Court Decisions. Tuscaloosa, AL: University of Alabama Press. pp. 218–233. ISBN 978-0-8173-1301-2.